Despite national recognition of female entrepreneurs, Ireland suffers from a low number of women engaged in business startups. Female-led businesses remain an underdeveloped source of economic growth and jobs. As part of a drive to increase the number of female entrepreneurs in Galway, Mayo and Roscommon, GMIT Innovation Hubs will deliver a second cycle of their regional programme called “EMPOWER”, commencing this month across the region. Ensuring that women with start-up ideas realise their full business potential is a major priority for this Programme. While Ireland has made more advances in relation to female entrepreneurs over the last number of years and women in the workplace, the rate of women starting their own businesses is still below that of what is could be. In Ireland, men are twice as likely to set up their own businesses as women. The rate of entrepreneurship for women in Ireland is seventh highest in Europe. However, men are still much more likely to inspire and motivate the next generation of engineers, astronauts, scientists, and innovators. The EMPOWER Programme aims to help tackle that. Maria Staunton Manager of the Empower Programme at GMIT says that during her time in GMIT’s Innovation Hubs she recognised the gap in the number of female versus male entrepreneurs. “We don’t get enough females coming forward to look at developing their ideas. I really believe female-led businesses are an underexploited source for economic growth and jobs. “Like most countries, Ireland has more male (63 per cent ) than female (37 per cent ) entrepreneurs. However, this gap is decreasing and through EMPOWER, GMIT aims to further decrease this by delivering a valuable programme that will benefit and support female entrepreneurs across Galway, Mayo and Roscommon”. The EMPOWER programme will help identify market opportunities, build confidence and assess skills to implement ideas and scale businesses. Last week Alison Cowzer from East Coast Bakehouse, Vicki O’Toole from J.J. O’Toole and best selling author and speaker Donna Kennedy took to the stage to talk about their own experiences and how they built their businesses. Alison discussed how they have grown a biscuit making operation in Drogheda, managing Brexit challenges, being a Dragon on RTE’s Dragon’s Den, what skills to look for in a promoter and key areas in a business proposition. Vicki touched on being propelled into the position of MD in a family business when her husband passed away, not understanding the ins and outs of business but yet having to learn very quickly and growing that 100-year-old packaging business to the €10 million turnover that it is today. She is currently a finalist in this year’s E&Y finals in October. Donna talked about her own experiences and challenges she faced and how she overcame those challenges to go on to turn her life around to the success it is today. She is a bestselling author, business and life coach and speaker. The theme of the evening was Discovering your True Passion and Purpose. Carol Coleman was the MC for the evening. Later that evening Norah Patten (Aeronautical Engineer ) Aine Mulloy (Founder of Crewgirl ) and Lorraine Corcoran (Co-Owner of Cosmetic Creations ) took to the stage. All three ladies are from the west. Norah is on track to become Ireland’s first person to go into space. She is one of 12 participants from around the world selected to take part in a unique scientist-astronaut training programme in Florida. She talked about things such as zero-gravity training flights and the hard work and dedication involved in this. Norah also has her own start-up called Planet Zebunar which is all about inspiring and motivating the next generation of engineers, astronauts, scientists and innovators. Norah took part in the national New Frontiers Entrepreneur Development Programme. Aine talked about their networking concept called GirlCrew and how they developed and scaled the app gaining market traction in several countries with a base now in San Francisco. She also touched on obtaining and attracting investment and how best to do that. Lorraine talked about buying Cosmetic Creations with her husband Aiden, their own interests in always developing new products (being engineers ) and how they have grown that business to recruit additional employee numbers. “I hope our event has inspired both male and female entrepreneurs to start a business and those established businesses to expand,” says Maria Staunton. I also want to thank our funders; the Department of Justice and Equality and the ESF, Mayo Local Enterprise Office, Lionbridge and GMIT for supporting the event. 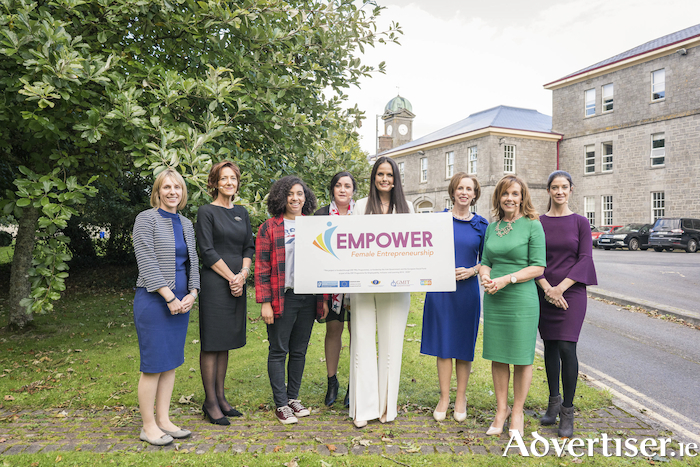 The EMPOWER project is co-funded by the Irish Government and the European Social Fund as part of the Programme for Employability, Inclusion and Learning 2014-2020’.